When you need a comfortable to wear branded shirt for your business, but don’t want to go down the road of a traditional business shirt, the Cool Dry Ladies Polo in short sleeve is a great choice. Made from polyester Cool Dry fabric, this polo will provide your employees with a business shirt that has anti-bacterial protection and UV protection, and is quick drying, iron free, breathable and completely comfortable to wear all day. 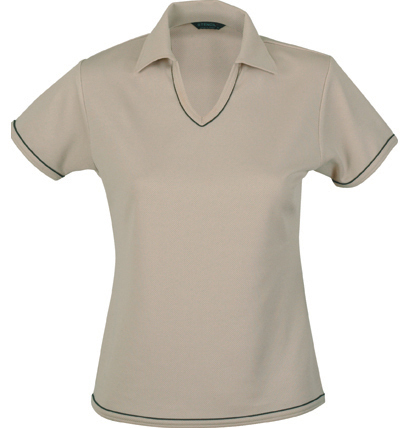 The Cool Dry Ladies Polo in short sleeve features a flattering fit, soft finish, side splits, contrast trim on the sleeves, hem and edge of placket. Available in a range of sizes from 8 – 22, this v-neck polo will suit any business. Choose from a large range of colour combinations to suit your business branding and add in an embroidered logo for marketing and branding opportunities. There’s plenty of options in the Cool Dry range to mix and match with including a long-sleeved version for ladies and a men’s range. The branded Cool Dry Ladies Polo in short sleeve will ensure your business gets the attention you require while ensuring your staff are comfortable throughout the day.